The Accidental Hedonist Gets Whiskey Right. I have been tardy in reviewing this excellent book, which I expected to hate but enjoyed immensely. Kate Hopkins, AKA "The Accidental Hedonist," takes a familiar approach. She decides to learn about whiskey by writing a book about it. She and a companion visit distilleries in Ireland, Scotland, Canada and the U.S. and the book is largely an account of their travels. Unlike most writers who have tried something similar, Hopkins is not just a good reporter, she is a good thinker. She doesn't just parrot what she's told (a hazard, since producers will feed you a lot of hooey), she thinks about it and inquires further. In the end, she gets almost everything right. There is so much hype surrounding beverage alcohol products that a writer’s best tool may be his or her BS detector. Hopkins has a good one, but she never lets debunking make her cranky. She is open-minded without being a sucker. Hopkins is a very good writer. She has fun on the trip and the reader does too. 99 Drams is an unexpected and fresh take on whiskey. I highly recommend it. Sazerac, the parent company of bourbon-maker Buffalo Trace, has acquired the Old Taylor brand and inventory from Beam Global Spirits and Wine, it was announced today. In return, Beam gets Effen Vodka. Old Taylor is a venerable bourbon with 19th century origins. It was named for its owner, E. H. Taylor, Jr., a banker who used his financial acumen to acquire and develop several major distilleries, including the one now known as Buffalo Trace. He had, however, a fraught relationship with that distillery’s owner at the time, George Stagg. Since they together had sold a bourbon under the Taylor name in happier days, Stagg sued to prevent Taylor from using the name. He lost. The Taylor distillery still stands, albeit in ruins, on the outskirts of Frankfort, adjacent to the ruins of Old Crow, in which Taylor also had an interest. A few years ago, Trace looked at buying the Old Taylor Distillery but ultimately passed. Beam acquired the Taylor brand, along with Old Crow and Old Grand-Dad, when it bought National Distillers in 1987. I've always felt that Beam should either do something with those distinguished brands or sell them. Now they have, at least one of them. As an indication of the current shortage of fully aged bourbon, the sale included enough Beam whiskey to support the Taylor brand until Buffalo Trace can make it from their own stocks. (Old Taylor is a 6-year-old straight bourbon.) Both Beam and Trace make a lot of whiskey and Taylor is a small brand, so clearly supplies are strained enough that whiskey needed to be part of the deal. Sazerac/Buffalo Trace, Old Taylor's new home, has been making some interesting moves lately, with the acquisition of the Constellation/Barton portfolio (which is how it got Effen) and the Tom Moore Distillery in Bardstown, but they haven't said much about what they intend to do with them, except that acquiring Barton’s super premium bourbon, Ridgemont Reserve 1792, was the primary goal. Now this. It will be fascinating to see what Trace does next. By the way, announcements about the deal came from both Beam and Sazerac. Beam’s was primarily about them acquiring Effen which--and this is hilarious--they claim is named after the Dutch word for 'smooth.' Yeah, right! Here is how Buffalo Trace is spinning the acquisition. Today, within minutes of each other, three press releases arrived in my in-box announcing the formation by Congressmen John Yarmuth and Brett Guthrie of the official and bi-partisan Congressional Bourbon Caucus (CBC). They were a joint press release from Yarmuth and Guthrie announcing it, and releases from the Kentucky Distillers Association (KDA) and Beam Global Spirits and Wine saying how great it is. The following, from the joint release by the two Representatives, explains the purpose of the caucus. "This caucus offers a solid base of bipartisan support for one of Kentucky’s most important industries and largest employers," said Congressman Yarmuth. "Congressman Guthrie and I both agreed it was important to create a working group that would advocate for this critical part of the Commonwealth’s economy." "I am proud to co‐chair this caucus with Congressman Yarmuth, as we strive to promote one of Kentucky’s signature industries," Congressman Guthrie said. "The bourbon industry is a vital part of the Commonwealth’s heritage that provides thousands of jobs, and this bipartisan caucus will ensure that the industry’s impact is valued." Seventeen Members of Congress from across the nation have signed on as original members of the caucus, and more are expected to join in the weeks ahead. Over 95 percent of the bourbon produced in the world is distilled and aged in the Commonwealth of Kentucky, where the alcoholic beverage industry employs over 43,000 Kentuckians. Over $3 billion of the gross state product in Kentucky is generated by distilled spirits and over 500,000 visitors annually tour the Commonwealth’s Bourbon Trail. Democrat Yarmuth's 3rd District is Louisville. Republican Guthrie's 2nd District covers a larger but less populated area that includes Bardstown, Owensboro, and about half of the state's distilleries. The KDA release tells us that three of Kentucky's four other US Representatives have signed on as well. They are Ben Chandler (D-KY 6th), Geoff Davis (R-KY 4th) and Ed Whitfield (R-KY 1st). It describes the Bourbon Caucus as a "key advocacy group to promote and protect bourbon" and adds another statistic: $100 million in taxes paid. None of the press releases mention this, but the CBC's sole holdout is Republican Hal Rogers, who represents the 5th, southeastern Kentucky. There are no distilleries in the 5th, most of the counties there are dry, and the region has a long history of going its own way versus the rest of the Commonwealth. 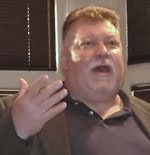 The Beam release contained much of the same content as the other two, but Fred Noe is quoted. "This is a great step for the Bourbon industry and 'America’s Native Spirit,'" said Frederick 'Fred' Booker Noe III, seventh-generation Jim Beam family distiller. "The Congressional Bourbon Caucus recognizes Bourbon’s unique place in American history and its positive impact on the economy." Beam's main contribution is that term 'America's Native Spirit,' which they like a lot and I grumbled about a little here. But no grumbling is allowed today, because this is a great day for America. While the industry commends the Congressmen, I commend the industry leaders who put this together. Bourbon is good for America and good for Kentucky. Any acknowledgment of that is a good thing. More Thoughts On The Whole Glenora v SWA Thing. What do scotch enthusiasts think about the Scotch Whiskey Association (SWA) and its nine-year campaign to prevent a small Canadian distillery from using the word "Glen" in its product name? I checked Kevin Erskine's The Scotch Blog, where Erskine offered his opinion, then turned the floor over to Mark Reynier of Scotland's Bruichladdich Distillery. I agree with both of them. As Erskine says, "it's silly and was a dumb fight for the SWA to pick." As Reynier points out, Glenora's VP and chief spokesperson is named Bob Scott, so the SWA should be glad he used a local place name and not his own surname. As anyone willing to look at the facts can see, Glenora actually went to great pains to make sure consumers understand that their whiskey is a product of Canada, not Scotland. I suppose it makes sense for the SWA to test the limits, push the envelope, all that, in its efforts to protect the image of Scotland-produced whiskey; but they should have thought about this 200 years ago or so, when Scots started to settle in other parts of the world, scattering Scottish place names about in their new homes. They maybe should also have been a little more original about their own distillery and brand naming, and not have everything be Glen-this and Glen-that. And the whole spelling thing--whiskey v whisky--has already been done to death. The real target here is not Canada anyway, it's India, where so-called "Indian Whiskey," a spirit usually not even made from grain, is marketed with tartans and Scottish-sounding names and every other bit of Scottish imagery the producers can get away with. The SWA's goal, of course, is to vanquish the fake scotch so consumers in that booming economy will buy more real scotch. Decision: "Glen" Does Not Equal "Scotch." On Thursday, the Supreme Court of Canada refused to hear the Scotch Whisky Association’s (SWA) appeal of a Federal Court of Appeal decision. The ruling allows Glenora Distillery of Nova Scotia to register the name "Glen Breton, Canada’s only single malt whisky," under the Trademarks Act of Canada. I wrote about this last Tuesday, the day the SWA announced its intention to appeal. The Supreme Court of Canada works fast. In reporting the Court's decision, the Chronicle Herald of Halifax provided some interesting background. Apparently, the SWA first registered their objections nine years ago. The attorney Glenora hired is a sole practitioner out of Halifax, Nova Scotia, named David Copp, who is originally from Cape Breton. You can read that story here. Although this settles the matter so far as sales in Canada are concerned, the SWA said Friday it could take action outside Canada (read: USA) depending on how Glenora markets its products internationally. Take a careful look at the picture above. What do you think it is? A bottle of liquor, of course, but what kind? You're allowed to read the label. 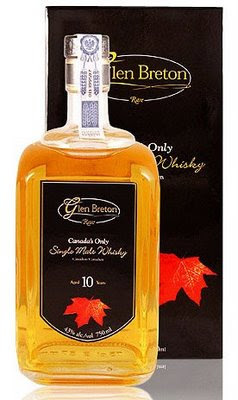 Here is what the producer, Glenora Distillery in Nova Scotia, has to say about it on its web site: "Glen Breton Rare Canadian Single Malt Whisky is the only single malt whisky produced in Canada. It is produced by the traditional copper pot stills method using only three ingredients: Barley, Yeast and Water." So what? Today it was announced that the Scotch Whisky Association (SWA) will appeal a Canadian court ruling allowing Glenora to call its product 'Glen Breton.' Why does the SWA care? Because it believes 'glen' means 'Scotch,' and if you put 'glen' in the name of a liquor, consumers will wrongly think it is scotch, and that would be bad. Never mind that Glen Breton does not use the word 'scotch,' that the word 'Canada' appears prominently on the label, and that the label even includes the Canadian maple leaf symbol. That doesn't matter to the SWA, because to them it's all about that word 'glen,' which means 'valley' in English, but in the original Gaelic can also mean 'river.' All of the famous scotch whiskeys that have 'glen' in their name refer to the river on which the distillery is sited, hence the Glenlivet Distillery is located on the Livet River. Nova Scotia is a Canadian province. It was largely settled by Scots, especially in the east where Glenora Distillery is located. Nova Scotia means "New Scotland." There are Scots all over the place in North America, so Scottish-sounding place names abound. In the Finger Lakes region of upstate New York, there are a number of valleys that reminded early settlers of Scottish glens, so they used that name. Watkins Glen, with its racetrack, is probably the best known. Heaven help anyone there who tries to use 'glen' as part of the name of a distilled spirits product. The long arm of the SWA will be there to swat you. Bill Dowd is a New York writer who interviewed David Williamson, public affairs manager of the SWA, about this case back in February. Bill's article about it is here. The gist of the SWA's case is that the public so strongly associates the word 'glen' with scotch whiskey that any use of that word on a non-Scotch liquor product is bound to confuse consumers and must, therefore, be prohibited. This case has been going on for years so at some point, whatever the merits, it starts to look like this big, well-funded trade group harassing a little guy who is just trying to make an honest product faithful to the heritage of its place of origin. I was an AV geek in high school. One day, a teacher explained to us that she was going to play a phonograph record, but at the same time she was going to record it on tape. She told us that we had to be perfectly quiet while it played and I could see why. The way she had set up to tape the record was by placing the microphone for the tape recorder in front of the phonograph's loudspeaker. I showed her how to jack the record player directly into the tape recorder without using the microphone, eliminating the need for anyone to worry about disturbing the recording. She accepted that my way would work, since I was after all the AV geek, but she insisted that everyone remain perfectly quiet, "just in case." You might suspect that this teacher was simply trying to ensure attentive silence during the playing of the record, but I can assure you that she did not understand what I had done nor that it was impossible for any noise we might have made to get onto the tape. James Thurber tells a similar story about his grandmother, in the early days of electric lighting, going around the house tightening the light bulbs, "so the electricity won't leak out." I learned a couple of lessons from that experience. Using my knowledge, I had accomplished the primary goal of ensuring a clean recording for the teacher. That I was unsuccessful at teaching her about the nature of what I had done was not, in the scheme of things, particularly important. I also learned that it is common for people in authority to know less than the people they are supposed to lead. That particular teacher was very stupid and everyone knew it. I learned that people often have authority they don't deserve, but they can still mess you up. "Just in case" is often used to defend ignorance. I'm frequently struck by people who have only the vaguest idea about how things they use every day -- cars, computers, mobile phones -- actually work. They try to make sense of their world as best they can. We're all like that about something. When you are trying to make sense of the world it's good to remember that there are things you know that other people don't and things they know that you don't. The lesson to take away is humility, not superiority. I Am Michael Jackson's Successor. I admire Hansell for asking that question in a public forum because anyone who writes about whiskey, as he does, can be suspected of harboring that ambition. Yet it is a natural question and one people have been asking privately for months. For those who don’t know, John Hansell publishes and contributes to Malt Advocate Magazine, a publication for whiskey enthusiasts, to which I also contribute. Michael Jackson was a pioneering writer who also contributed to Malt Advocate until his 2007 death. Mr. Hansell, in answer to your question, I am Michael Jackson’s successor. Let me quickly add that I do not claim that mantle exclusively. I think you are one of Jackson’s successors too. I can name at least a dozen others. Michael Jackson has many successors. I did not know Michael Jackson except through his work. To me, he was a guy who tried to learn as much as he could about subjects that interested him, then shared what he learned through the art of prose. I can relate. That he inspired me and others to follow his path is a key part of his legacy. I do not know how Jackson felt about the title “beer and whiskey writer.” I’ve never liked it. That most of what he wrote touched in some way on beer or whiskey is undeniable, but that was just a way to tell a story about a place, a company, or a person, perhaps an artisan. He wrote about history and culture, passion and ambition, creativity and serendipity, not just beer and whiskey. But as a writer who happened to write about drinks, he taught us more than anyone else has about how to approach that subject. I admire him for that. Also for his breadth of curiosity, his intelligence, his honesty, his modesty, and his wit. I like that he never hid his idiosyncrasies, or his insecurities. He wrote in a style that appealed to him. He never tried to dumb it down or tart it up. Because Michael Jackson inspired so many people to share what they've learned about beer and whiskey, he can never have a sole successor. That is part of his legacy too. No one will ever replace Michael Jackson. We don’t need a replacement since we still have the original. I hope people will continue to read him for a long time. For instance, I would love to see someone publish a collection of the columns he wrote for Malt Advocate and other periodicals. As for me, I will continue to do my best to put one word in front of the other without stumbling over them and landing on my face. I do not measure myself against Michael Jackson, I wouldn’t dare. That’s not what being one of his successors is about. It is about never forgetting where you came from or who got you to where you are. For me, and I know many others, Michael Jackson was the first person who made writing about drinks seem like a good idea. Maybe someday, someone will say something similar about me. That would be nice. Nelson County Approves Sunday Sales. Shouldn't You? As predicted two weeks ago, Nelson County has followed its county seat, the city of Bardstown, in legalizing alcohol sales on Sunday. The county ruling covers unincorporated areas as well as any municipalities that do not already have their own contrary rule. Bardstown calls itself the Bourbon Capital of the World®. Slowly but surely, they are starting to act like it. Like many states, Kentucky lets local jurisdictions set their own rules about alcohol sales, including prohibiting them entirely. Some people equate that with Prohibition but it isn't quite that because it only deals with sales. Possession, transportation and use are all legal and the local jurisdiction can't do anything about that. The definition of 'local' varies by state, but Kentucky's law allows Louisville to let something as small as an individual voting precinct outlaw alcohol sales within its boundaries. The neighborhood I used to live in used that to get rid of a bar they didn't like, called Mother's, that happened to be the only bar in the precinct. It was replaced in the space by a music store that kept the name. Chicago has the same sort of thing. According the The Encyclopedia of Chicago, nearly one-fifth of Chicago's more than 2,700 precincts restrict the sale of alcohol. In an economy like the one we have now, issues like this start to shift. What's worse for a neighborhood's vitality? Bars and liquor stores, or empty storefronts? History Of CMDK On YouTube. CMDK is the abbreviation for Charles Medley Distillers Kentucky, the name of the old Owensboro distillery purchased by Angostura Limited in 2007. Derek Schneider is the plant manager. CMDK isn't making any whiskey yet, as its restoration still has a way to go. That means there won't be any whiskey ready to drink for several years, but that hasn't stopped Schneider from getting the name out there. It's basically a one-man operation right now, but that one man is something special. In addition to managing the distillery restoration, he has become a PR juggernaut. Schneider recognizes that the American whiskey enthusiast community is almost as hungry for information as it is for the drink itself. Working on a shoestring budget, Schneider is doing whatever he can to oblige. I heartily approve. So take that into consideration as you view the video below, or visit the CMDK web site. Neither is the kind of slick production you might expect from a Jack Daniel's or Jim Beam, but it gets the job done. Below the CMDK History and Origins video Schneider put together is a report about the distillery from Fox News, which features shots of Woodford Reserve, and comments by Woodford Master Distiller Chris Morris and Brown-Forman PR chief Phil Lynch. Morris had an association with CMDK 20 years ago when he worked for the distillery's previous owner. I have some friends who are divers and whenever video footage shot underwater appears on TV, no matter what it is, they perk up. I saw it happen once during a Red Lobster commercial. I'm the same way if I see whiskey barrels. If you are like me and can't get enough of this sort of thing, here you go. The United States consumes a lot of whiskey. Know what country consumes more? If you said, “India,” you would be both right and wrong. Probably you have heard about the booming Indian economy. Even in the current malaise, India is booming and creating unprecedented economic growth. That’s thirsty work. India has a domestic distilled spirits industry but her vast consumer markets are being eyed eagerly by the big international drinks companies like Diageo and Pernod Ricard too. Whiskey is very popular there. Unfortunately, most of what they call whiskey is not the same as what we call whiskey. Although a few snobs believe that only a distillate made from 100 percent malted barley should be called whiskey, most Americans and Europeans agree that whiskey is any spirit made from grain, distilled at a relatively low proof, and aged in wood. India prefers a more expansive definition. They recognize our kind of whiskey but they call un-aged spirits made mostly or entirely from sugarcane whiskey too. Not only do they call it whiskey, they color and flavor it so it resembles scotch, which was introduced to India during the British colonial period. Many brands have Scottish-sounding names and use Scottish imagery in their packaging. India has made distilled spirits from sugarcane for centuries, since even before the Raj. Neither the European Union (EU) nor the United States will permit non-grain whiskey to be imported into our markets and sold here as whiskey. This is only a problem because it is getting in the way of our desire to sell our whiskey to them. EU regulations have become very influential internationally and other countries have adopted them too, creating a de facto world standard, with India on the wrong side of it. In 2007, India’s UB Spirits Company bought Scotland’s Whyte & Mackay for $1.5 billion. The sale included 115 million liters (30.4 million gallons) of aging scotch whiskey. The Whyte & Mackay line was launched in India early this year and already has a 13 percent market share, according to the new CEO. Not all domestic Indian ‘whiskey’ needs finger quotes. Amrut is made from malted barley grown in Punjab and Rajasthan. It is a two-million case brand, big by anybody’s standards. It is available in the United Kingdom, but I haven’t seen it here.